She makes it glory now to be a man. We have this double interest in early American literature, that it is our own and unlike any other. The literatures of Europe began with wonder tales of a golden age, with stories of fairy ships, of kings akin to gods, of heroes who ventured into enchanted regions and there waged battle with dragons or the powers of darkness. American literature began with historical records, with letters of love and friendship, with diaries or journals of exploration, with elegiac poems lamenting the death of beloved leaders or hearth companions,--in a word, with the chronicles of human experience. In this respect, of recording the facts and the truth of life as men and women fronted life bravely in the New World, our early literature differs radically from that of any other great nation: it brings us face to face not with myths or shadows but with our ancestors. TWO VIEWS OF THE PIONEERS. It has become almost a habit among historians to disparage early American literature, and nearly all our textbooks apologize for it on the ground that the forefathers had no artistic feeling, their souls being oppressed by the gloom and rigor of Puritanism. Even as we read this apology our eyes rest contentedly upon a beautiful old piece of Colonial furniture, fashioned most artistically by the very men who are pitied for their want of art. We remember also that the Puritans furnished only one of several strong elements in early American life, and that wherever the Puritan influence was strongest there books and literary culture did most abound: their private libraries, for example, make our own appear rather small and trashy by comparison. [Footnote: When Plymouth consisted of a score of cabins and a meetinghouse it had at least two excellent libraries. Bradford had over three hundred books, and Brewster four hundred, consisting of works of poetry, philosophy, science, devotion, and miscellanies covering the entire field of human knowledge. In view of the scarcity of books in 1620, one of these collections, which were common in all the New England settlements, was equivalent to a modern library of thirty or forty thousand volumes.] Cotton Mather, disciplined in the strictest of Puritan homes, wrote his poems in Greek, conducted a large foreign correspondence in Latin, read enormously, published four hundred works, and in thousands of citations proved himself intimate with the world’s books of poetry and history, science and religion. That the leaders of the colonies, south and north, were masters of an excellent prose style is evident from their own records; that their style was influenced by their familiarity with the best literature appears in many ways,--in the immense collection of books in Byrd’s mansion in Virginia, for instance, or in the abundant quotations that are found in nearly all Colonial writings. Before entering college (and there was never another land with so few people and so many colleges as Colonial America) boys of fourteen passed a classical examination which few graduates would now care to face; and the men of our early legislatures produced state papers which for force of reasoning and lucidity of expression have never been surpassed. Again, our whole conception of American art may be modified by these considerations: that it requires more genius to build a free state than to make a sonnet, and the Colonists were mighty state-builders; that a ship is a beautiful object, and American ships with their graceful lines and towering clouds of canvas were once famous the world over; that architecture is a noble art, and Colonial architecture still charms us by its beauty and utility after three hundred years of experimental building. “Art” is a great word, and we use it too narrowly when we apply it to an ode of Shelley or a mutilated statue of Praxiteles, but are silent before a Colonial church or a free commonwealth or the Constitution of the United States. Instead of an apology for our early literature, therefore, we offer this possible explanation: that our forefathers, who set their faces to one of the most heroic tasks ever undertaken by man, were too busy with great deeds inspired by the ideal of liberty to find leisure for the epic or drama in which the deeds and the ideal should be worthily reflected. They left that work of commemoration to others, and they are still waiting patiently for their poet. Meanwhile we read the straightforward record which they left as their only literary memorial, not as we read the imaginative story of Beowulf or Ulysses, but for the clear light of truth which it sheds upon the fathers and mothers of a great nation. The Colonial period extends from the first English settlement at Jamestown to the Stamp Act and other measures of “taxation without representation” which tended to unite the colonies and arouse the sleeping spirit of nationality. During this century and a half the Elizabethan dramatists produced their best work; Milton, Bunyan, Dryden and a score of lesser writers were adding to the wealth of English literature; but not a single noteworthy volume crossed the Atlantic to reflect in Europe the lyric of the wilderness, the drama of the commonwealth, the epic of democracy. Such books as were written here dealt largely with matters of religion, government and exploration; and we shall hardly read these books with sympathy, and therefore with understanding, unless we remember two facts: that the Colonists, grown weary of ancient tyranny, were determined to write a new page in the world’s history; and that they reverently believed God had called them to make that new page record the triumph of freedom and manhood. Hence the historical impulse and the moral or religious bent of nearly all our early writers. ANNALISTS AND HISTORIANS. Of the fifty or more annalists of the period we select two as typical of the rest. The first is William Bradford (cir. 1590-1657), a noble and learned man, at one time governor of the Plymouth Colony. In collaboration with Winslow he wrote a Journal of the Mayflower’s voyage (long known as Mourt’s Relation), and he continued this work independently by writing Of Plimouth Plantation, a ruggedly sincere history of the trials and triumph of the Pilgrim Fathers. The second annalist is William Byrd (1674-1744), who, a century after Bradford, wrote his History of the Dividing Line and two other breezy Journals that depict with equal ease and gayety the southern society of the early days and the march or campfire scenes of an exploring party in the wilderness. These two writers unconsciously reflected two distinct influences in Colonial literature, which are epitomized in the words “Puritan” and “Cavalier.” Bradford, though a Pilgrim (not a Puritan), was profoundly influenced by the puritanic spirit of his age, with its militant independence, its zeal for liberty and righteousness, its confidence in the divine guidance of human affairs. When he wrote his history, therefore, he was in the mood of one to whom the Lord had said, as to Abraham, “Get thee out of thy country, and from thy kindred, and from thy father’s house; and I will make of thee a great nation.” Byrd, though born and bred in democratic Virginia, had in him something of the aristocrat. He reminds us of the gay Cavaliers who left England to escape the stern discipline of Cromwell and the triumphant Puritans. When he looked forth upon his goodly plantation, or upon the wilderness with its teeming game, he saw them not with the eyes of prophet or evangelist, but as one who remembered that it was written, “And God saw everything that he had made; and behold it was very good.” So he wrote his Journal in an entertaining way, making the best of misfortune, cracking a joke at difficulty or danger, and was well content to reflect this pleasant world without taking it upon his conscience to criticize or reform it. The same two types of Cavalier and Puritan appear constantly in our own and other literatures as representative of two world-views, two philosophies. Chaucer and Langland were early examples in English poetry, the one with his Canterbury Tales, the other with his Piers Plowman; and ever since then the same two classes of writers have been reflecting the same life from two different angles. They are not English or American but human types; they appear in every age and in every free nation. Cheer on, brave souls, my heart is with you all. But he was too much absorbed in stern theological dogmas to find the beauty of life or the gold of poesie; and his masterpiece, once prized by an immense circle of readers, seems now a grotesque affair, which might appear even horrible were it not rendered harmless by its jigging, Yankee-Doodle versification. The most extravagantly praised versifier of the age, and the first to win a reputation in England as well as in America, was Anne Bradstreet (1612-1672), who wrote a book of poems that a London publisher proudly issued under the title of The Tenth Muse (1650). The best of Colonial poets was Thomas Godfrey of Philadelphia (1736-1763), whose Juvenile Poems, with the Prince of Parthia, a Tragedy contained a few lyrics, odes and pastorals that were different in form and spirit from anything hitherto attempted on this side of the Atlantic. This slender volume was published in 1765, soon after Godfrey’s untimely death. With its evident love of beauty and its carefulness of poetic form, it marks the beginning here of artistic literature; that is, literature which was written to please readers rather than to teach history or moral lessons. NATURE AND HUMAN NATURE. In the literature of the world the two subjects of abiding poetic interest are nature and human nature; but as these subjects appear in Colonial records they are uniformly prosaic, and the reason is very simple. Before nature can be the theme of poets she must assume her winsome mood, must “soothe and heal and bless” the human heart after the clamor of politics, the weariness of trade, the cruel strife of society. To read Wordsworth’s “Tintern Abbey” or Bryant’s “To a Waterfowl” is to understand the above criticism. But the nature which the Colonists first looked upon seemed wild and strange and often terrible. Their somber forests were vast, mysterious, forbidding; and they knew not what perils lurked in them or beyond them. The new climate might give them sunshine or healing rain, but was quite as likely to strike their houses with thunderbolts or harrow their harvests with a cyclone. Meanwhile marauding crows pulled up their precious corn; fierce owls with tufted heads preyed upon their poultry; bears and eagles harried their flocks; the winter wail of the wolf pack or the scream of a hungry panther, sounding through icy, echoless woods, made them shiver in their cabins and draw nearer the blazing fire of pine knots on the hearth. We can understand, therefore, why there was little poetry of nature in Colonial literature, and why, instead of sonnets to moonbeams or nightingales, we meet quaint and fascinating studies of natural or unnatural history. Such are Josselyn’s New England’s Rarities Discovered and the first part of William Wood’s New England’s Prospect; and such are many chapters of Byrd’s Dividing Line and other annals that deal with plant or animal life,--books that we now read with pleasure, since the nature that was once wild and strange has become in our eyes familiar and dear. As for the second subject of poetic interest, human nature, the Colonists had as much of that as any other people; but human nature as it revealed itself in religious controversy, or became a burden in the immigrants that were unloaded on our shores for the relief of Europe or the enrichment of the early transportation companies, as Bradford and Beverley both tell us,--this furnished a vital subject not for poetry but for prose and protest. The Indians especially, “the wild men” as they were called, slipping out of the shadows or vanishing into mysterious distances, were a source of anxiety and endless speculation to the early settlers. European writers like Rousseau, who had never seen an Indian or heard a war-whoop, had been industrious in idealizing the savages, attributing to them all manner of noble virtues; and the sentimental attitude of these foreign writers was reflected here, after the eastern Indians had well-nigh vanished, in such stories as Mrs. Morton’s Quabi, or The Virtues of Nature, a romance in verse which was published in 1790. In the same romantic strain are Cooper’s Last of the Mohicans, Helen Hunt’s Ramona and some of the early poems of Freneau and Whittier. The Colonists, on the other hand, had no poetic illusions about the savages. Their enjoyment of this phase of human nature was hardly possible so long as they had to proceed warily on a forest trail, their eyes keen for the first glimpse of a hideously painted face, their ears alert for the twang of a bowstring or the hiss of a feathered arrow. Their deep but practical interest in the Indians found expression in scores of books, which fall roughly into three groups. In the first are the scholarly works of the heroic John Eliot, “the apostle to the Indians”; of Daniel Gookin also, and of a few others who made careful studies of the language and customs of the various Indian tribes. In the second group are the startling experiences of men and women who were carried away by the savages, leaving slaughtered children and burning homes behind them. Such are Mary Rowlandson’s The Sovereignty and Goodness of God and John Williams’s The Redeemed Captive, both famous in their day, and still of lively interest. In the third group are the fighting stories, such as John Mason’s History of the Pequot War. The adventures and hairbreadth escapes recorded as sober facts in these narratives were an excellent substitute for fiction during the Colonial period. Moreover, they furnished a motive and method for the Indian tales and Wild West stories which have since appeared as the sands of the sea for multitude. RELIGIOUS WRITERS. A very large part of our early writings is devoted to religious subjects, and for an excellent reason; namely, that large numbers of the Colonists came to America to escape religious strife or persecution at home. In the New World they sought religious peace as well as freedom of worship, and were determined to secure it not only for themselves but for their children’s children. Hence in nearly all their writings the religious motive was uppermost. Hardly were they settled here, however, when they were rudely disturbed by agitators who fomented discord by preaching each his own pet doctrine or heresy. Presently arose a score of controversial writers; and then Anne Hutchinson, Roger Williams and the early Quakers were disciplined or banished, not because of their faith (for the fact is that all the colonies contained men of widely different beliefs who lived peaceably together), but because these unbalanced reformers were obstinately bent upon stirring up strife in a community which had crossed three thousand miles of ocean in search of peace. Of the theological writers we again select two, not because they were typical,--for it is hard to determine who, among the hundred writers that fronted the burning question of religious tolerance, were representative of their age,--but simply because they towered head and shoulders above their contemporaries. These are Cotton Mather and Jonathan Edwards; the one the most busy man of his age in politics, religion, education and all philanthropic endeavor; the other a profound thinker, who was in the world but not of it, and who devoted the great powers of his mind to such problems as the freedom of the human will and the origin of the religious impulse in humanity. Cotton Mather (1663-1728) is commonly known by his Wonders of the Invisible World, which dealt with the matter of demons and witchcraft; but that is one of the least of his four hundred works, and it has given a wrong impression of the author and of the age in which he lived. His chief work is the Magnalia Christi Americana, or the Ecclesiastical History of New England (1702), which is a strange jumble of patriotism and pedantry, of wisdom and foolishness, written in the fantastic style of Robert Burton’s Anatomy of Melancholy. The most interesting and valuable parts of this chaotic work are the second and third books, which give us the life stories of Bradford, Winthrop, Eliot, Phipps and many other heroic worthies who helped mightily in laying the foundation of the American republic. The purpose of God and the fate of man. The literary period included in the above term is, in general, the latter half of the eighteenth century; more particularly it extends from the Stamp Act (1765), which united the colonies in opposition to Britain’s policy of taxation, to the adoption of the Constitution (1787) and the inauguration of Washington as first president of the new nation. The writings of this stormy period reflect the temper of two very different classes who were engaged in constant literary Party warfare. In the tense years which preceded the Literature Revolution the American people separated into two hostile parties: the Tories, or Loyalists, who supported the mother country; and the Whigs, or Patriots, who insisted on the right of the colonies to manage their own affairs, and who furnished the armies that followed Washington in the War of Independence. Then, when America had won a place among the free nations of the world, her people were again divided on the question of the Constitution. On the one side were the Federalists, who aimed at union in the strictest sense; that is, at a strongly centralized government with immense powers over all its parts. On the other side were the Anti-Federalists, or Antis, who distrusted the monarchical tendency of every centralized government since time began, and who aimed to safeguard democracy by leaving the governing power as largely as possible in the hands of the several states. It is necessary to have these distinctions clearly in mind in reading Revolutionary literature, for a very large part of its prose and poetry reflects the antagonistic aims or ideals of two parties which stood in constant and most bitter opposition. In general, the literature of the Revolution is dominated by political and practical interests; it deals frankly with this present world, aims to find the best way through its difficulties, and so appears in marked contrast with the theological bent and pervasive “other worldliness” of Colonial writings. BENJAMIN FRANKLIN. Standing between the two eras, and marking the transition from spiritual to practical interests, is Benjamin Franklin (1706-1790), a “self-made” man, who seems well content with his handiwork. During the latter part of his life and for a century after his death he was held up to young Americans as a striking example of practical wisdom and worldly success. The narrative of Franklin’s patriotic service belongs to political rather than to literary history; for though his pen was busy for almost seventy years, during which time he produced an immense amount of writing, his end was always very practical rather than aesthetic; that is, he aimed to instruct rather than to please his readers. Only one of his works is now widely known, the incomplete Autobiography, which is in the form of a letter telling a straightforward story of Franklin’s early life, of the disadvantages under which he labored and the industry by which he overcame them. For some reason the book has become a “classic” in our literature, and young Americans are urged to read it; though they often show an independent taste by regarding it askance. As an example of what may be accomplished by perseverance, and as a stimulus to industry in the prosaic matter of getting a living, it doubtless has its value; but one will learn nothing of love or courtesy or reverence or loyalty to high ideals by reading it; neither will one find in its self-satisfied pages any conception of the moral dignity of humanity or of the infinite value of the human soul. The chief trouble with the Autobiography and most other works of Franklin is that in them mind and matter, character and reputation, virtue and prosperity, are for the most part hopelessly confounded. On the other hand, there is a sincerity, a plain directness of style in the writings of Franklin which makes them pleasantly readable. Unlike some other apostles of “common sense” he is always courteous and of a friendly spirit; he seems to respect the reader as well as himself and, even in his argumentative or humorous passages, is almost invariably dignified in expression. REVOLUTIONARY POETRY. The poetry of the Revolution, an abundant but weedy crop, was badly influenced by two factors: by the political strife between Patriots and Loyalists, and by the slavish imitation of Pope and other formalists who were then the models for nearly all versifiers on both sides of the Atlantic. The former influence appears in numerous ballads or narrative poems, which were as popular in the days of Washington as ever they were in the time of Robin Hood. Every important event of the Revolution was promptly celebrated in verse; but as the country was then sharply divided, almost every ballad had a Whig or a Tory twist to it. In consequence we must read two different collections, such as Moore’s Songs and Ballads of the American Revolution and Sargent’s Loyalist Poetry of the Revolution, for supplementary views of the same great struggle. The influence of Pope and his school is especially noticeable in the work of a group of men called the Hartford Wits, who at the beginning of our national life had the worthy ambition to create a national literature. Prominent among these so-called wits were Joel Barlow (1754-1812) and Timothy Dwight (1752-1817). In such ponderous works as Barlow’s Columbiad and Dwight’s Conquest of Canaan, both written in mechanical rhymed couplets, we have a reflection not of the glories of American history, as the authors intended, but of two aspiring men who, without genius or humor, hoped by industry to produce poems that in size at least should be worthy of a country that stretched between two oceans. More gifted than either of his fellow “wits” was John Trumbull (1750-1831), who had the instinct of a poet but who was led aside by the strife of Whigs and Tories into the barren field of political satire. His best-known work is M’Fingal (1775), a burlesque poem in the doggerel style of Butler’s Hudibras, which ridiculed a Tory squire and described his barbarous punishment at the hands of a riotous mob of Whigs. It was the most widely quoted poem of the entire Revolutionary period, and is still interesting as an example of rough humor and as a reflection of the militant age in which it was produced. By far the best poet of the Revolution was Philip Freneau (1752-1832). In his early years he took Milton instead of Pope for his poetic master; then, as his independence increased, he sought the ancient source of all poetry in the feeling of the human heart in presence of nature or human nature. In such poems as “The House of Night,” “Indian Burying Ground,” “Wild Honeysuckle,” “Eutaw Springs,” “Ruins of a Country Inn” and a few others in which he speaks from his own heart, he anticipated the work of Wordsworth, Coleridge and other leaders of what is now commonly known as the romantic revival in English poetry. When the Revolution drew on apace Freneau abandoned his poetic dream and exercised a ferocious talent for satiric verse in lashing English generals, native Tories, royal proclamations and other matters far removed from poetry. In later years he wrote much prose also, and being a radical and outspoken democrat he became a thorn in the side of Washington and the Federal party. The bulk of his work, both prose and verse, is a red-peppery kind of commentary on the political history of the age in which he lived. ORATORS AND STATESMEN. For a full century, or from the Stamp Act to the Civil War, oratory was a potent influence in molding our national life; and unlike other influences, which grow by slow degrees, it sprang into vigorous life in the period of intense agitation that preceded the Revolution. Never before or since has the power of the spoken word been more manifest than during the years when questions of state were debated, not by kings or counselors behind closed doors, but by representative men in open assembly, by farmers and artisans in town halls fronting a village green, by scholarly ministers in the pulpits of churches whose white steeples with their golden vanes spoke silently, ceaselessly, of God and Freedom as the two motives which had inspired the fathers to brave the perils of a savage wilderness. Among the most famous addresses of the age were the speech of James Otis in the town hall at Boston (1761) and the “Liberty or Death” speech of Patrick Henry to the Virginia burgesses assembled in St. John’s church in Richmond (1775). To compare these stirring appeals to patriotism with the parliamentary addresses of a brilliant contemporary, Edmund Burke, is to note a striking difference between English and American oratory of the period, the one charming the ear by its eloquence, the other rousing the will to action like a bugle call. The statesmen of the Revolution, that glorious band whom Washington led, were also voluminous writers and masters of a clear, forceful style; but it would probably surprise them now to find themselves included in a history of literature. In truth, they hardly belong there; for they wrote not with any artistic impulse to create a work of beauty that should please their readers; their practical aim was to inculcate sound political principles or to move their readers to the right action. If we contrast them with certain of their British contemporaries, with Goldsmith and Burns for example, the truth of the above criticism will be evident. Nevertheless, these statesmen produced a body of so-called citizen literature, devoted to the principles and duties of free government, which has never been rivaled in its own field and which is quite as remarkable in its own way as the nature poetry of Bryant or the romances of Cooper or any other purely literary work produced in America. HAMILTON AND JEFFERSON. These two statesmen, who became bitter antagonists during the struggle over the Constitution, may be selected as typical of all the rest. The story of their splendid services in the cause of liberty cannot be told here; such men belong to history rather than to literature; but we may at least note that they deserve more careful and unprejudiced study than rival political parties have thus far given them. Their work has a broad human interest which extends far beyond the borders of America, since they stand for two radically different conceptions of life, one aristocratic, the other democratic, which appear in every age and explain the political and social divisions among free peoples. Hamilton (the Federalist) denied the right and the ability of common men to govern themselves; he was the champion of aristocracy, of class privilege, of centralized power in the hands of the few whom he deemed worthy by birth or talent to govern a nation. The most significant trait of Jefferson (the Anti-Federalist) was his lifelong devotion to democracy. He believed in common men, in their ability to choose the right and their purpose to follow it, and he mightily opposed every tendency to aristocracy or class privilege in America. In the struggle over the Constitution he was fearful that the United States government would become monarchical if given too much authority, and aimed to safeguard democracy by leaving the governing power as largely as possible in the hands of the several states. To readers who are not politicians the most interesting thing concerning these two leaders is that Hamilton, the champion of aristocracy, was obscurely born and appeared here as a stranger to make his own way by his own efforts; while Jefferson, the uncompromising democrat, came from an excellent Virginia family and was familiar from his youth with aristocratic society. The best-known work of Hamilton (to which Madison and Jay contributed liberally) is The Federalist (1787). This is a remarkable series of essays supporting the Constitution and illuminating the principles of union and federation. The one work of Jefferson which will make his name remembered to all ages is the Declaration of Independence. Besides this document, which is less a state paper than a prose chant of freedom, he wrote a multitude of works, a part of which are now collected in ten large volumes. These are known only to historians; but the casual reader will find many things of interest in Jefferson’s Letters, in his Autobiography and in his Summary View of the Rights of America (1774). The last-named work gave Burke some information and inspiration for his famous oration “On Conciliation with America” and was a potent influence in uniting the colonies in their struggle for independence. “What then is the American, this new man? He is either a European or a descendant of a European; hence that strange mixture of blood, which you will find in no other country. I could point out to you a family whose grandfather was an Englishman, whose wife was Dutch, whose son married a French woman, and whose present four sons have now four wives of different nations. He is an American who, leaving behind him all his ancient prejudices and manners, receives new ones from the new mode of life he has embraced, the new government he obeys, the new rank he holds. He becomes an American by being received in the broad lap of our great Alma Mater. BEGINNING OF AMERICAN FICTION. Those who imagine that American fiction began with Irving or Cooper or Poe, as is sometimes alleged, will be interested to learn of Susanna Rowson (daughter of an English father and an American mother), whose later stories, at least, belong to our literature. In 1790 she published Charlotte Temple, a romance that was immensely popular in its own day and that has proved far more enduring than any modern “best seller.” During the next century the book ran through more than one hundred editions, the last appearing in 1905; and from first to last it has had probably more readers than any novel of Scott or Cooper or Dickens. The reception of this work indicates the widespread interest in fiction here in the late eighteenth century. Moreover, as there were then two types of fiction in England, the sentimentalism of Richardson and the realism of Fielding, so in America the gushing romances of Mrs. Rowson were opposed by the Female Quixotism and other alleged realistic stories of Tabitha Tenney. Both schools of fiction had here their authors and their multitudinous readers while Irving and Cooper were learning their alphabet and Poe was yet unborn. Into the crude but hopeful beginnings of American fiction we shall not enter, for the simple reason that our earliest romances are hardly worth the time or patience of any but historical students. At the close of the Revolutionary period, however, appeared a writer whom we may call with some justice the first American novelist. This was Charles Brockden Brown (1771-1810), who is worthy to be remembered on three counts: he was the first in this country to follow literature as a profession; he chose American rather than foreign heroes, and pictured them against an American background; and finally, his use of horrible or grotesque incidents was copied by Poe, his Indian adventures suggested a fruitful theme to Cooper, and his minute analysis of motives and emotions was carried out in a more artistic way by Hawthorne. Hence we may find in Brown’s neglected works something of the material and the method of our three greatest writers of fiction. The six romances of Brown are all dominated by the motive of horror, and are modeled on the so-called Gothic novel with its sentimental heroine, its diabolical villain, its ghastly mystery, its passages of prolonged agony. If we ask why an American writer should choose this bizarre type, the answer is that agonizing stories were precisely what readers then wanted, and Brown depended upon his stories for his daily bread. At the present time a different kind of fiction is momentarily popular; yet if we begin one of Brown’s bloodcurdling romances, the chances are that we shall finish it, since it appeals to that strange interest in morbid themes which leads so many to read Poe or some other purveyor of horrors and mysteries. Wieland (1798) is commonly regarded as the best of Brown’s works, but is too grotesque and horrible to be recommended. Edgar Huntley (1801), with its Indian adventures depicted against a background of wild nature, is a little more wholesome, and may serve very well as a type of the romances that interested readers a century or more ago. SUMMARY. The Colonial period covers the century and a half from the settlement of Jamestown, in 1607, to the Stamp Act of 1765. The literature of this early age shows two general characteristics, one historical, the other theological. The Colonists believed that they were chosen by God to establish a new nation of freemen; hence their tendency to write annals and to preserve every document that might be of use to the future republic. 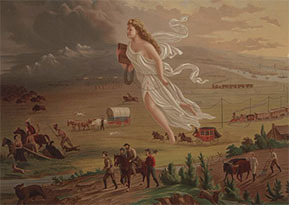 Moreover, they were for the most part religious men and women; they aimed to give their children sound education and godly character; hence their insistence on schools and universities (seven colleges were quickly founded in the wilderness) for the training of leaders of the people; hence also the religious note which sounds through nearly all their writing. In our review of the Colonial period we noted four classes of writers: (i) The annalists and historians, of whom Bradford and Byrd were selected as typical of two classes of writers who appear constantly in our own and other literatures. (2) The poets, of whom Wigglesworth, Anne Bradstreet and Godfrey are the most notable. (3) A few characteristic books dealing with nature and the Indians, which served readers of those days in the place of fiction. (4) Theological writers, among whom Cotton Mather and Jonathan Edwards are the most conspicuous. The Revolutionary period extends from 1765 to the close of the century. A large part of the literature of this period deals, in the early years, with the strife of Loyalists and Patriots or, in the later years, with the word wars of Federalists and Anti-Federalists. These are the political parties into which America was divided by the Revolution and by the question of the Constitution. In general, Revolutionary writing has a practical bent in marked contrast with the theological spirit of Colonial writing. Our study of Revolutionary literature includes: (1) Benjamin Franklin who marks the transition from Colonial to Revolutionary times, from spiritual to worldly interests. (2) Revolutionary poetry, with its numerous ballads and political satires; the effort of the Hartford Wits to establish a national literature; and the work of Philip Freneau, who was a romantic poet at heart, but who was led aside by the strife of the age into political and satiric writing. (3) Orators and statesmen, of whom Otis and Henry, Hamilton and Jefferson were selected as typical. (4) Miscellaneous writers such as Paine, Crevecoeur, Carver, Abigail Adams and John Woolman who reflected the life of the times from various angles. (5) Charles Brockden Brown, and the beginning of American fiction. SELECTIONS FOR READING. Typical selections in Cairns, Selections from Early American Writers; Trent and Wells, Colonial Prose and Poetry; Stedman and Hutchinson, Library of American Literature, and other anthologies (see “Selections” in the General Bibliography). A convenient volume containing a few selections from every important American author is Calhoun and MacAlarney, Readings from American Literature (Ginn and Company). Bradford’s Of Plimoth Plantation and John Smith’s Settlement of Virginia, in Maynard’s Historical Readings. Chronicles of the Pilgrims, in Everyman’s Library. Various records of early American history and literature, in Old South Leaflets (Old South Meeting House, Boston). Franklin’s Autobiography, in Standard English Classics, Holt’s English Readings and several other school editions (see “Texts” in General Bibliography). Poor Richard’s Almanac, in Riverside Literature. The Federalist and Letters from an American Farmer, in Everyman’s Library. Woolman’s Journal, in Macmillan’s Pocket Classics. BIBLIOGRAPHY. For reference works covering the entire field of American history and literature see the General Bibliography. The following works deal with the Colonial and Revolutionary periods. HISTORY. Fisher, The Colonial Era; Thwaite, The Colonies; Fiske, Old Virginia and her Neighbors, Beginnings of New England, Dutch and Quaker Colonies in America. Fisher, Quaker Colonies in America. Winsor, Handbook of the Revolution; Sloane, French War and the Revolution; Fisher, Struggle for American Independence; Fiske, A Critical Period of American History; Hart, Formation of the Union. Studies of social life in Earle, Home Life in Colonial Days; Fisher, Men, Women and Manners of Colonial Times; Crawford, Romantic Days in the Early Republic. LITERATURE. Tyler, History of American Literature, 1607-1765, and Literary History of the Revolution; Sears, American Literature of the Colonial and National Periods; Marble, Heralds of American Literature (a few Revolutionary authors); Patterson, Spirit of the American Revolution as Revealed in the Poetry of the Period; Loshe, The Early American Novel (includes a study of Charles Brockden Brown). Life of Franklin, by Bigelow, 3 vols., by Parton, 2 vols., by McMaster, by Morse, etc. Lives of other Colonial and Revolutionary worthies in American Statesmen, Makers of America, Cyclopedia of American Biography, etc. (see “Biography” in General Bibliography). FICTION. A few historical novels dealing with Colonial times are: Cooper, Satanstoe, The Red Rover; Kennedy, Rob of the Bowl; Hawthorne, The Scarlet Letter; Motley, Merry Mount; Cooke, The Virginia Comedians; Carruthers, Cavaliers of Virginia; Austin, Standish of Standish; Barr, The Black Shilling; Mary Johnston, To Have and to Hold. Novels with a Revolutionary setting are: Cooper, The Spy, The Pilot; Simms, The Partisan, Katherine Walton; Kennedy, Horseshoe Robinson; Winthrop, Edwin Brothertoft; Eggleston, A Carolina Cavalier; Maurice Thompson, Alice of Old Vincennes; Mitchell, Hugh Wynne; Churchill, Richard Carvel; Gertrude Atherton, The Conqueror.